" Angelus Glow in the Dark Angelus Duller Angelus Sole Bright Angelus 2 Thin Angelus Dye Liner Pen"
Angelus 2 Thin solvent reducer is used with acrylic leather paint, in mixing colour. 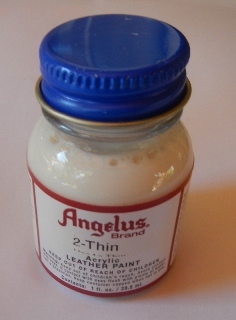 Angelus 2 Thin can be used to mix paints for spraying or thinning. Recommended to adjust viscosity of colour. The long awaited Angelus Glow In The Dark Paint is finally here! Shake well & shake often. Place bottle back into included box when not in use! Ensure article is clean & dry before application. Apply multiple thin coats using a fine paint brush or sponge pad. Allow to dry for 48 hours before wearing. For higher gloss and scuff protection, apply 1-2 coats of Angelus Acrylic Finisher. Tips: For the brightest glow, apply Angelus Glow Paint over a light colored surface. Multiple coats are necessary to achieve full & even coverage. For the longest lasting glow, charge using UV light (sunlight) or light bulb for 5+ minutes. For airbrush use, at least a .35mm nozzle is recommended. No thinning necessary. Notes: Keep the paint bottle out of sunlight when not in use! Angelus Glow Paint applies with a slight hint of a green color. The more coats that are applied, the more green will appear. A rough/chalky feel is normal once Angelus Glow In The Dark Paint is completely dry. To create a much smoother feel, apply 1-2 coats of Angelus Acrylic Finisher following the glow. *Afterglow brightness naturally drops over time, but can still last for up to 2,000 minutes on a full charge! Please test color before application. Caution: Some articles have a silicone finish applied at the factory, it may be necessary to clean these items with Angelus Leather Preparer & Deglazer or Angelus Dry Cleaner & Spot Remover. Silicone treated articles may cause paint to not adhere correctly to article. 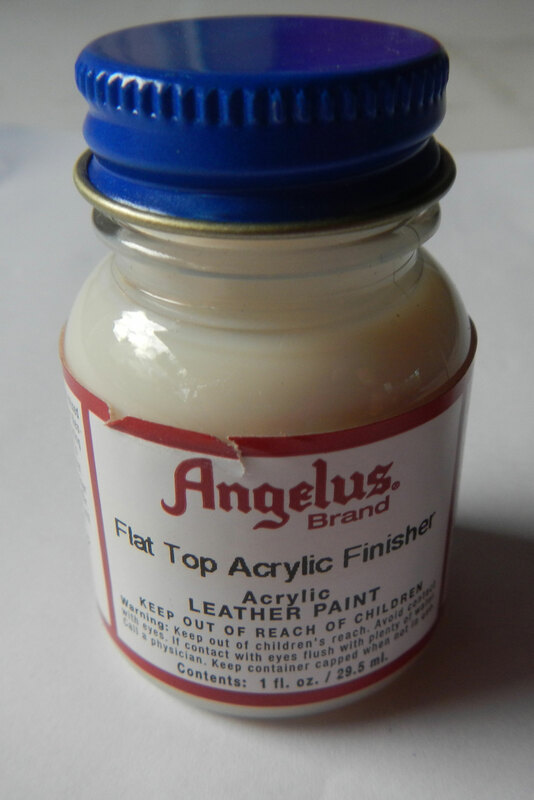 Angelus Flat Top finisher is used after applying Angelus acrylic leather paint and you want to finish the product so that the paint is protected. If applying over leather dye make sure the article is dry before application. For smooth leathers only, do not use on suede. Angelus Sole Bright is a multiuse product used to remove the oxidising parts on articles such as yellowing soles. It will also remove hazing from products. Uses the sun or UV ligght to activate and remove oxidation. Will restore yellowed soles back to original colour. Makes the soles o your sneakers new again. Angelus duller is used in making the Angelus leather Paint to give less gloss . It is a gloss reducer. Duller may also be added to each finisher for a more Matte shine. We do not recommend adding more than 0.5 oz of duller to a 4 oz. bottle of finisher. This is great for fine detailed work and touch up areas you missed. Angelus Dye Liner Pen comes with instruction on how to fill and use. You can use it over and over again just refill with the same dye. You can fill the Angelus dyeliner fine tip or broad tip with Angelus Leather Dye or Suede Dye but not with Angelus Paint. Before dyeing, remove any dirt or existing finish by using Angelus Preparer and Deglazer. use one of the many finishes available from Angelus .